A full colour map of the Grand Union Canal from Milton Keynes to London, including the London and East London Rings suitable for both waterways and leisure users. 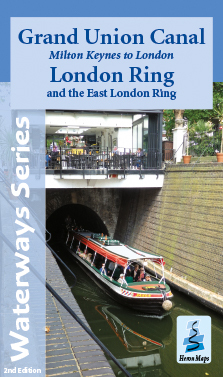 This map gives detailed coverage of the Grand Union Canal from Milton Keynes to London, including the London and East London Rings, with emphasis on the waterways and information useful and relevant to users of the waterways without neglecting other leisure users. The map detail is complimented by information panels and photographs. The Grand Union Canal is Britain's longest canal, running 137 miles from London to Birmingham. This map covers the eastern end from Milton Keynes to London including the Aylesbury, Wendover and Slough Arms, it also incorporates the London and East London Rings. This map starts in Milton Keynes, on exiting the city it heads south westwards through Buckinghamshire, Hertfordshire, and the Chilterns before reaching Hemel Hempstead and Kings Langley before passing beneath the M25. The canal turns south skirting the edge of Greater London passing through the Colne Valley Park to Uxbridge before reaching Cowley Peachy Junction. Here the main line heads west into the capital, whilst the Slough Arm heads eastwards. Just past Hayes, the Paddington Arm heads north from Bull's Bridge Junction, then through West London along 14 lock-free miles of waterway to Paddington and Little Venice, whilst the main line continues onto Brentford and the Thames. At Little Venice the Regent's Canal continues west passing through Regent's Park, past London Zoo's aviary, onto Camden and its famous market, before heading into the East End and finally joining the River Thames at Limehouse Basin. This tourist map is at 1:50000 scale with detailed town plans of Milton Keynes, Fenny Stratford, Aylesbury, Marsworth, Berkhamsted, Rickmansworth, Little Venice and Paddington, and Camden Town at 1:12500 scale, as well as showing the Grand Union Canal Walk, Britain's first national waterways walk. Click here to see area covered by this map. Includes navigation and historical information, visitor moorings, marinas and boatyards, boat hire centres, facilities for the boat user, shops, post offices and distance markers. Information for the tourist includes tourist information centres, places of interest, pubs, nature reserves, parks, churches, national cycle routes, long distance paths, public toilets and caravan and camp sites. The Grand Union Canal, Milton Keynes to London map is available to buy online or by telephone from our business partner, Guidepost. Click on the logo below to visit their store.